This is a story about a website. Like many stories, however, the lessons are not about the obvious. It is a story about how redesigning a website created a structure for reconsidering an organization. I serve on the executive committee of an international organization (actually, a federation of organizations), and have for the last ten years or so. The federation has never really had a physical presence, such as an office with furniture and employees. Like many professional associations, it is run by volunteers on a minimal budget, and has always been a “virtual organization” of sorts. The official business of the federation has been conducted at in-person board meetings every two years, by as many representatives as are able to attend from different countries around the world. In addition, each member organization typically has held its own annual conference; four to five days involving in-person presentations of academic papers. Like most organizations, the federation developed a website. This occurred sometime after 2000, at a time when organizational websites were becoming increasingly prevalent and relatively easy to create. At that time, it wasn’t always clear what the site was supposed to accomplish, other than giving basic information about the organization (sort of a billboard on the Internet), but there were growing expectations that every organization should have one. The original website was a basic, static html site. Later, however, the site migrated to Drupal – an “open source content management platform,” that is essentially an “industrial strength” platform for the website, allowing greater flexibility and easier management by end-users. The change in the site platform created greater online functionality for the federation. The website still housed organizational and member information, but could now also store documents, proceedings from meetings, newsletters, and other information that could be made easily accessible to members. It was something of an office and storeroom on the web. This past year, the federation embarked on once again rebuilding the site, this time using Wordpress. The push was to move towards social media – Web 2.0. (The specific software and platforms are irrelevant in this case – it is the change in functionality which is important.) While this may sound trite (hasn’t every organization been through this? ), this recent cross over to social media has presented significant challenges in ways that I never would have expected. It has caused us to think about, and rethink, the basic purpose of the organization, and of its relationships with member organizations and the world-at-large. The primary shift from static representation to social media is about interactivity. With that comes expectations about its use. The issue is not technology; it is about how the technology changes, or at least is expected to change, our human behavior. One of the first issues we encountered was age. The people represented by the federation’s members are heavily skewed on the right side of the timeline – that is, we represent an aging population, with only a small minority of people under 50 years old. These demographics impact our technology use. Most of us grew up with radios and televisions, not computers and the Internet. 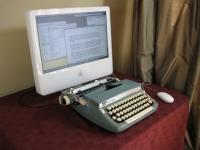 Papers were written by hand, or typed on typewriters. Fortunately for the federation, the new web effort was spearheaded by younger people with perspectives shaped by different skills and experiences. However, those different viewpoints quickly collided with the realities of our organizational membership. An inherent assumption of about social media is that is draws a high level of activity. In practice, this means that a site without regular updates is considered dead. Search engines (such as Google, Yahoo, Bing, etc.) rank sites, and then present them in search results, largely based on the perceived importance of the site. If you don’t show up on the first page of a search, your site is lost in the thousands of other “hits” that will probably never even get viewed. Comments on web content demand quick responses so as not to offend the commenters. And all of those are just “old website” issues. They don’t even begin to account for RSS feeds, tweets, and so on. Our current reality is that the data Internet users are creating is starting to look like plankton in the oceans. You cannot begin to think of examining each individual specimen. If you can aggregate enough of it in the right way, it might prove to be useful. For the federation’s website renewal, our first lession was that older people don’t tweet. In fact, most of the people served by our members don’t have, or contribute to, blogs or websites. If they engage in online forums, those tend to be closed – available only to registered members. The easy assumption is that aging people are rapidly losing relevance. Actually, however, people 45 – 55 are a growing user group on Facebook, while teens are using it less. And while there is a Facebook group for systems science, it does not contain the kinds of information typically exchanged by our organizational members. All this only leads us to the rest of the story. Historically, most system scientists, as academics and scientists in general, published “finished documents” – primarily articles in peer-reviewed journals or books, supplemented with papers in conference proceedings, and so on. Discussions were rarely recorded, and notes were taken only for personal use. Through our web technician, we discovered in decades of newsletters and proceedings a body of information that would never have been widely distributed, but which yielded insights about the people and personalities behind the formal writings. This is material which is much closer to what might now be posted in website articles or more thoughtful blogs. It provides glimpses into discussions where ideas were being challenged and theories being formulated. In order to make the text of this material searchable, it had to be stripped from PDF files, and in many cases from scanned copies printed on paper – something of a miniature version of the Google Books project. This was a time-consuming and expensive task for a small organization, but the material seemed to represent value that had not been realized. How, then, do the tools that we create on the web promote the value, and the values, of the federation? How do we retain what is good in terms of relationships and collaboration, and bring those into an age where time and distance begin to blur? How do we bring people of different generations into a shared space with such different expectations about their interactions? We will continue to emphasize the development of rigorous ideas and theories, but how much transparency about the process will be important? We launched a beta version of the new website at the international conference of one of our member organizations this past summer. The introduction was brief, but well-received. The more difficult challenge of getting people to inhabit our new space now begins.